Paula's Student Lee and Lucy earned their CDX at the Farminton, UT show Mar 2019, including a 2nd and 4th place! Paula's Student Melissa and K'tara (GSD) earned ther UD at the Oct 2018 show qualifying all but one day! Paula's Student Brittany and Teal'c earned their CDX at the Boise show Oct 2018 with lots of blue ribbons! Paula an Ziva earned their IPO2 this summer! Paula's Student Melissa and K'tara (GSD) earned ther CDX and are working on their UD. Paula's student Vitaliy and his GSD Willa earned their BN, CD and IPO1 titles! Paula's student Lee and her Chihuahua mix Lucy earned their Novice (CD) titles! Paula's student Vitaliy and his GSD Willa earned their first two Beginner Novice legs with a 2nd and 1st place (197!!!). Paula's student Lee and her Chihuahua mix Lucy earned their Beginner Novice Title at the November Boise Trial with scores in the mid-190s and a 1st and two 2nds! Paula's student Karla and her GSD Avi earned their Grad Open title and two bonus legs! Paula's student Laurie and her Border Collie, Jet, earned their CD in fine style (1st, 196+) in Idaho Falls, ID! Paula's student Karla and her GSD Avi earned their first Grad Open leg with a solid performance! Paula and Ziva re-certified with NAPWDA in Cadaver and Obedience for the 8th consecutive year! Paula and Ziva earned their UDX and OM1 at the Blackfoot show as well as two 2nd Places and OTCH points! Paula's student Melissa and her GSD K'tara earned their CDX and 2 bonus legs at the Blackfoot show. THREE 1st Place finishes!!! Paula and Ziva earned their 8th and 9th UDX legs at the Beehive Cluster as well as two 2nd places, a third and a fourth! Paula and Ziva earned a High In Trial and High Combined in Pendleton, OR with a First in Open B and a First in Utility B! Ziva earned another First and UDX leg as well! Paula's student Melissa and her GSD K'tara earned their 2nd CDX leg with a First place! Paula's student Karla and her GSD Avi earned their CDX title in Pendleton, OR! They came home with two First and one Second Place! Paula's Student Melissa and her GSD K'tara earned their AKC CD with one bonus leg - three 1st and one 2nd place! Wow! This is a Novice A dog and handler! Paula and Ziva earned their UD at the Farmington trial and earned a bonus leg on day two with a 4th place! Paula's student Karla and her GSD Avi earned all three legs of their Beginner Novice title with three 1st Places at the Farmington trial! Avi is only 15 mo old! Paula's student Tricia and her GSD Boo earned their CD Title at the Farmington AKC trial in September 2016! First place!! Paula and Ziva recertified with NAPWDA in obedience and Cadaver Search in MT in July! Paula's11th year certifying with NAPWDA. Paula and Ziva competed in the UKC July 2016 trial and earned their U-CDX and RO2 with placements! Paula and Ziva competed in UKC in November 2015 earning their U-CD and RO1 with placements and a Rally HIT! Paula's student Tricia and her GSD Boo earned their first two CD legs at the Boise March show! Paula's student Patti and her GSD Ozzie earned their CD title with placements at the Boise March AKC obedience trial! Paula and Ziva competed at the March Farmington, UT show in Open B and earned a 1st and 2nd place!!! Their 198 score held up to tie for High In Trial on Saturday. Paula's student Patti and her GSD Ozzie competed in AKC for the first time in Novice B and earned a 3rd place for their first CD leg! Paula and Ziva competed at the March Boise show in Open B on Saturday and earned a 4th place! Paula's student, Karla and her GSD Timber earned their UD the first day of the Boise show with a 2nd place! They moved up to Utility B and earned a 4th place on Saturday! Paula and Ziva earned their CDX title at the Boise show! After two long days of search work, Ziva compted in the ICCKC Obedience trial and qualified all four days in Open B, placing three of those - a 2nd, 3rd and 4th! Watch for Suzie's Zion's Bank home mortgae commercial on TV! She's a star! Paula and Ziva competed in Open B in Filer at the AKC Obedience Trial, earning a 2nd place, 196.5 and 1st CDX leg! Paula and Ziva competed at the Boise Dog Show all four days in Graduate Novice. They placed 1st each day with scoes in the mid to upper 190's! Paula & Ziva re certified with NAPWDA, passing the Obedience and Cadaver certification in WA, April, 2013! Paula and Ashley enjoyed a 3 day seminar with world class competitor, Mia Skogster of Finland. It was fantastic! Lots of great info! Ashley and Bee (Paula's Apprentice and Ziva's littermate) earned their BH at the Solstice Hundesport Club's WDA Trial in September as well! It was lovely!!! Paula & Ziva earned their BH at the Solstice Hundesport Club's WDA Trial in September! Paula & Ziva attended a phenomenal training seminar with Peter & Connie Scherk and Dr. Florian Knabl of Team Heuwinkl from Germany! Paula & Ziva re-certified with NAPWDA in Cadaver (+ obedience), March 2012 in WA State! Congrats to Paula's student Tyler and his mix Nesta for earning their CDX at the Boise show! Paula finished Ziva's CD (Companion Dog) and BN (Beginner Novice) titles at the local dog show Oct 13-16th. Ziva earned a few placements along the way! Congrats to Paula's student Michelle and her dog Lucy - they earned their UDX this weekend, double Q'd all three days! Last show they were also 3 for 3! Congrats to Paula's student Tiffany and her dog Mica - they earned their UD and two bonus legs this weekend in Farmington, UT!!!! Today was a 196.5! Excellent! Ziva and Paula and enjoyed working to help verify historic graves on the Oregon Trail and getting the opportunity to train on known graves as well. Suzie's picture is not only on the web representing AKC's full recognition of the Bluetick Coohound, but she is in Parks & Rec Business magazine as well! Paula's student Tiffany and her dog Mica earned their 2nd UD leg with a first place in Utility A and a 194.5! Paula's student Michelle and her dog Lucy earned their 5th-7th UDX legs and placed in Utility B all three days in Idaho Falls!! Paula and Ziva attended a NAPWDA workshop and also pased their cadaver re-certification! Paula's student Michelle and her dog Lucy earned their 3rd UDX leg and placed in Utility B! Paula's student Tiffany and her aussie Mica competed in Utility A for the first time and earned their first leg with a 191.5!!!! CONGRATS!!! Paula and Ziva spent a fantastic week in El Paso training with the US Border Patrol! Lots learned! Ziva and Jeb found a missing man in Owyhee County (my condolences to the family). This was Ziva's first find!!! Very good work by both dogs. Jeb was in Dog World for his accomplishments in obedience despite his breed not being known for it! Paula and Jeb are in an article in the AKC Gazette about senior canines. Precision K-9 student Tyler's dog Nesta is the first mixed breed to earn an obedience title in Idaho!!!! Jeb passed his Area cert at 11.5 yrs of age. He thoroughly enjoyed it! Ziva passed her NAPWDA Cadaver certification at 15 mo old! I'm very proud of her!! Suzie finished her obedience career in Filer, ID earning her UDX4 with a 2nd in UB and 3rd in OB! Suzie won Open B AGAIN and went HIT AGAIN Saturday, May 8th in UT. She earned her 38th and 39th UDX legs as well! Suzie won Open B with a 198.5 and went High In Trial earning her OTCH on Friday, May 7th, 2010 in UT!!!!! CONGRATS OTCH SUZIE!!!!! Suzie & Paula showed in UT (3/19-21) and won two High Combined Awards, a 3rd in Utility B (196) and a 2nd in both UB (196.5) and Open B (198+). Suzie now has 37 UDX legs and 115 OTCH points!! Still close to that Open win......soon!!! Dec 30th the Bluetick will be fully recognized by the AKC!!!! Suzie, Jeb and myself are featured in the Gazette's article about the Bluetick this month. It's a great article about a great breed! Go Blues! Also in WA, Suzie earned her Obedience Master 2 (OM2) Title! In Ridgefield, WA earlier in December Suzie earned her 35th UDX leg with a 4th in UB and a 2nd (198+) in OB after winning a run-off. Suzie now has 103 OTCH points and is creeping ever closer to that OB Win that wil earn that OTCH!!!! Suzie showed in Salem OR and earned two more UDX legs!! #33, #34!! She also earned High Combined on Saturday wining a huge ribbon and an embroidered chair (that made ME very happy!!)!! We now have our own private training facility! Boise Show Day 4: Sunday gets better! Suzie won UB with a 197.5 putting her at 96!!! OTCH points. She also placed 3rd in OB with a 197 and earned another High Combined. What a day!! Go Blueticks!!! Boise Show Day 3: Saturday Suzie WON UB and earned her 31st UDX leg. Jeb had the day off. Boise Show Day 2: Friday Jeb earned his Versatility Title with another 1st Place!!! Boise Show Day 1: Thursday Suzie went 2nd in UB and 2nd in OB for High Combined and her UDX3 Title! Jeb won Versatility! Wenatchee, WA - Sept 2009 Suzie showed again and earned a 3rd in UB and a 2nd UB for a couple more OTCH points. She is up to 58 points! Woo hoo! Jeb will not show again until Boise where he will retire from obedience. Hopefully you can join us at the show! Eugene, OR - Sept 2009 Jeb showed one day in Versatility for a 1st place! Suzie showed all 4 days in Open B and Utility B and was in the ribbons all but one class! She came home with 6 OTCH points as well as a 2nd, two 3rds and several 4ths!!! I was very proud of her. We had a long time between trials, but we finally showed again the first of June: Suzie earned four UDX legs (now was 24) and her first High Combined! She earned a 1st, 2nd and a 4th in Utility B, a 2nd and 4th in Open B and more OTCH points -- she now is half way there with 50!! Jeb showed for fun and earned a 3rd in Utility B.
Albany, OR (again): Suzie earned her UDX2, won Utility B for 17 OTCH points with a 197 and a 4th in UB with a 195.5! Jeb placed 2nd in UB for 5 OTCH points just a 1/2 pt behind Suzie (196.5). A great weekend! Utah: Consistent Suzie earned her 17th, 18th and 19th UDX legs! Jeb earned a 3rd in Utility B for another OTCH Point! No NQ's in 3 days! Albany, OR Show: Suzie earned 16th UDX leg, 2nd in Utility (tied for 1st!!) and Jeb tied for 2nd in Utility and ended up 3rd. A great weekend for Suzie and the start of Jeb's "Farewell Tour". Salem Show: Suzie earned her 15th UDX leg and tied for 1st in a large Utility B class. She earned 2nd place for 7 OTCH points! Boise Show: Jeb earned OTCH points and Suzie earned UDX legs as well as a personal best 197 in Open B! We were in the ribbons all but one of the four days! Students earned 3 CDs, a CDX several placements and a HIT! Sept 2008 Paula showed Jeb & Suzie in an obedience trial in OR. Suzie earned her UDX Title + 2 more UDX legs and Jeb came home with more OTCH Points (he has 156)!!! August 2008 - Paula attended the NAPWDA Western States Workshop in Billings, MT. Suzie passed her Trailing and Obedience certifications, Jack passed his Trailing certification and Jeb passed his Cadaver, Obedience and SAR Area certifications!! Congrats!! June 2008 Jeb showed in Utility B three days and earned two 2nd places, winning a run off for one of them and earning more OTCH points!! May 2008 in South Jordan, UT Suzie and Jeb showed 4 days. Suzie earned 3 more UDX legs, all with placements and earned another OTCH point! She even tied for High Combined, losing by onl a 1/2 point. :) Jeb Q'd all four days, placing each day and earned more OTCH points! This week Jeb pinpointed the grave of a man missing for almost 2 years. I was very proud of him! Sunday, March 23rd, Jeb won Utility B (198) and placed 2nd in Open B (198) for High Combined! What a great way to finish up his career in Open! Suzie also did very well Sunday, earning her 3rd UDX leg! Saturday, March 22nd, Jeb won Utility B for more OTCH points (now at 135) and Suzie earned her 2nd UDX leg and a 3rd in Open B! Friday, March 21st Jeb finished his UDX3 with a 2nd in both Utility B and Open B. Suzie earned her first UDX leg with a 3rd in Utility B. Both earned more OTCh points! Jeb is ranked in the AKC Hound Group based on his OTCH points. He is in the TOP TEN HOUNDS of all time in OTCH Points! Jeb's Obedience Trial Championship (OTCH) is a breed first for blueticks as well as a coonhound first (all the coonhound breeds) and an IDAHO FIRST! Sunday, Feb 10th in Oregon Jeb earned his 29th UDX leg with a 1st place in Utility B and 17 additional OTCH points! The big news is Suzie was 3rd in the same class with a 195 for her FIRST 2 OTCH Points!! Jeb went High Combined (4th in another large Open B class). Saturday, Feb 9th in Oregon Suzie and Jeb tied for 4th in a very large Open B class with 17 of those dogs qualifying! They ran off against each other and SUZIE won the run off! Jeb placed 2nd in UB (197) for 7 points. We have 102! He also earned his 28th UDX leg! Friday in Puyallup, WA, Jeb earned his 9th UDX leg in a row (4th in UB). He now has 27 UDX legs. On Saturday Jeb placed 3rd in Open for 1 OTCH point. NOI Summary: 90+ dogs competed; Jeb scratched an itch on the long down losing 30pts, but still earned his way to day 2 (31st overall); Day 2 Jeb was 18th seed; without the scratching, Jeb would have been 11th overall!!!!!! WOW!!!!!!!! He didn't NQ a single other exercise all weekend in the 6 rings. Jeb earned his 25th & 26th UDX legs (he's earned 8 in a row!) as well as a 2nd and 4th in Utility B in Salem, OR. This gave him 8 more OTCH points....we're at 94!!! Only SIX more to go!!!!! Boise Show Brags: Jeb earned High Combined 3 of the 4 days, earning himself 19 more OTCH Points! He now has 86 of the 100 required for the title! Boise Show Results! On Sunday Suzie showed in Open B and placed 2nd, just .5 point behind Jeb with a 196--her AKC personal best! Boise Show Brags! Over the 4 days, Jeb earned 4 more UDX legs, he now has 24! Boise Show Results! Saturday AND Sunday Jeb placed 1st in BOTH Utility B and Open B for High Combined! Boise Show Results! Thursday Jeb place 1st in Utility B, 2nd in Open B for High Combined! Friday Jeb placed 2nd in Open B! Jeb is the first coonhound in history to earn a UDX2 Title! He was only the 2nd to earn a UDX! Jeb is the first coonhound in history to earn a UDX2 Title! He was only the 2nd to earn a UDX. Jeb dominated the FSS (Foundation Stock Service) Breeds in the First & Foremost Rating System (2006): 1st Place with 179 points! Jeb's sidekick Suzie placed 2nd! September 29-30, 2007 Jeb and Paula competed in Richland, WA earning High Combined, 2nd in Utility B and 2nd in Open B on Saturday for UDX leg #19. On Sunday they again took 2nd in both classes earning their UDX2 Title!!! This also earned them more OTCH points. Jeb now has 67 of the 100 needed!! August 2007 Jeb and Suzie passed the following NAPWDA Certifications: (Jeb): Cadaver, Area, Tracking, Obedience. (Suzie): Tracking, Trailing and Obedience. September 2007 Jeb and Paula competed in Eugene, OR earning an 18th UDX leg and a 3rd in Utility B for more OTCH points! August 2007 Jeb and Paula competed in Enumclaw, WA earning a 17th UDX leg and a 2nd in Utility B for 5 more OTCH points! July 2007 Jeb and Paula competed in Reno, NV earning a 16th UDX leg! He was high scoring hound and scent hound as well! In May, Jeb passed his International Police Working Dog Association (IPWDA) Basic Cadaver Dog Certification! June 2007 Jeb & Paula were in Blackfoot, ID. Day 1: High Combined, 2nd in Utility, 2nd in Open (198); Day 2: High Combined, High In Trial (198), 1st in Open, 1st in Utility; Day 3: 2nd in Util (196) We now have 58 OTCH points and 15 UDX Legs! June 2007 Jeb and Paula were back in UT competing, earning another High Combined (HC), more OTCH points, 13th UDX leg, 1st in Utility and 3rd in Open. Day two they earned a 2nd in Open! All with nice scores in the mid-190's. Jeb was also highest scoring hound and veteran both days! June 2007 Paula, Jeb and Suzie entered their first ASCA Trial to earn ASCA Companion Dog Titles. Suzie was 2nd and Jeb was 1st in all three trials. Jeb earned High In Trial each time, his scores going as high as 199 and 199.5. 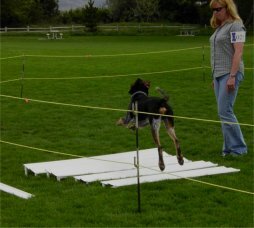 In May 2007 Jeb was finally back into the obedience ring. Although not our best weekend, Jeb earned a High Combined, 12th UDX Leg, 2 OTCH Points, a 1st and 2nd in Utility, and a 2nd in Open. In April, the AKC flew Jeb and Paula out to TN for their St. Jude's Event (fundraiser) in Decatur County. Page down to see Jeb in action. Jeb and Paula made it to the podium in Long Beach!!! They were 3rd Runner-Up at the National Obedience Invitational!!!! Watch for write-ups in Dog Fancy, AKC's Gazette and AKC's Family Dog Magazines. Jeb and Paula won the Hound Group at the National Obedience Invitational!! Look at www.akc.org for overall results and photo coverage. Jeb and Paula head to Long Beach, CA in December to compete in the Eukanuba National Obedience Invitational! Jeb has been very active in search and rescue this year. Many times he wasn't showing, he was working as a SAR dog. I am very proud of him for being able to do that and then days later be able to go in the obedience ring and shine. October 29, 2006 Suzie earned her UCDX! She earned her 3 legs in 3 tries with two 2nd places and a 4th. October 28, 2006 Jeb earned his UUD with a 198.5 and 1st place! The following day, he was 2nd with a 194. October 15, 2006 Jeb took 2nd in Utility B and 1st in Open B! He now has 43 OTCH points!! October 13, 2006 Jeb won 4th in Open B with a 195! October 12, 2006 at the Boise AKC Show Jeb earned his UDX and won High Combined (1st in Open B 194.5; 2nd in Utility B 196.5)!! October 12, 2006 at the Boise AKC Show Suzie earned her UD! She earned her 3 UD legs for the title her first three times in the utility ring! September 2006 Paula and Suzie competed in WA in Utility B. This was Suzie's first time in Utility and she earned UD leg #1 with a 3rd and UD leg #2 with a 4th place!!! September 2006 Paula and Jeb competed in WA and earned their 9th UDX leg!!! One more to go! September 2006 Paula and Jeb competed in Utah and earned their 7th and 8th UDX legs!! Two more to go! They were also 4th in Open B on Sunday. July 2006 Paula and Jeb competed in Reno earning another UDX leg, 2nd in Utility B (193), High Scoring Hound, High Scoring Scenthound and HIGH COMBINED (197.5 in Open B) and 4 more OTCh pts!!! June 2006 Paula and Jeb competed in UT and ID earning another UDX leg, winning a runoff in Utility B for 3rd place and their first OTCh point, tying for High Combined after a personal best scores in Utility B: 196.5 (2nd Place) and in Open B: 198 (2nd Place), and earning another OTCh point!!! 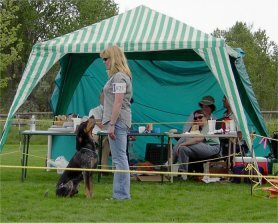 May 2006 Paula and Jeb competed in a UKC trial. Jeb earned 2 High In Trials, a High Combined, 2 UUD legs and 3 Open legs -- 3 first places and 2 2nd places. April 2006, Jeb earned his UD title!!!! Jeb qualified 3 of 4 times in the ring with a 2nd place and two 1st places. January 2006, Jeb and Paula made their Utility debut. Jeb earned his first UD leg with a 1st Place (193.5)! January 2006, Suzie earned her CDX (all 3 legs in her first 3 tries) with a 2nd place and two 1st places and a personal best score of 194! In 2004, Jeb was nationally ranked. He was 3rd in the Misc. Group in AKC Competition Obedience! October 2005 Paula and Suzie competed in the Boise AKC show and earned Suzie's 3rd CD leg for her CD title with a 192 and 3rd place! June 2005 Paula and Jeb competed in 2 AKC obedience trials in Open B: He scored mid-190's and earned a 1st place and a 2nd place (tied for 1st, 2nd in the runoff)! June 2005 Paula and Suzie competed in Suzie's first 2 AKC trials in Novice B. Suzie scored in the 190's and placed 3rd and 1st! June 2005, Suzie and Paula passed their NASAR Canine SARTECH III - Trailing certification! May 2005 Paula competed in a UKC trial with Jeb & Suzie. There were 3 trials: Jeb earned his U-CDX - 3 1st places, 2 High In Trials; Suzie earned her U-CD - 2 1st and 1 2nd place! All scores were 190's! April 2005 Jeb and Paula passed their NASAR Canine SARTECH III - Air Scent certification! October 2004, Paula and Jeb competed in the Boise AKC show in Open A. Day 1: Jeb earned his 3rd leg for his CDX title with a 196 and 1st place in a class of 14 dogs! Day 2: Jeb qualified again in the 190's with a 2nd place out of 18 dogs! April 2004 Jeb and Paula tried Open A for the first time and earned 2 legs with 2 first place finishes. Again, all scores in the 190's! August 2004 Jeb made his debut as Boise Parks and Rec Spokesdog! January 2004 Jeb and Paula made their debut in the AKC competition obedience ring. They entered 3 days, got 3 CD legs, therefore earning an AKC CD! Jeb placed 2nd, 3rd, then 1st with a 197! September 2003 Jeb was crowned Boise Parks and Rec Spokesdog/Posterdog. He competed against over 90 dogs and won the final contest against 5 other dogs at the Hyde Park Street Fair!